With the rapid development of IC industry and the improvement of special components as well as multifunction of electronic components, the number of pins in unit area are substantially increasing, which accelerated the transfer of QFP & TCP to BGA & CSP and promoted the obvious change of PCB technology. PCB products are also developing towards ultra-thin, small components, high density and fine spacing. As the density of components on the PCB increases, PCB's wire width, spacing and bonding pad become smaller and smaller. The traditional MVI and ICT technology cannot fully adapt to the development of manufacturing technology because of "limited contact" (limited electrical contact and visual contact). Therefore, AOI has become an inevitable demand of PCB manufacturing industry, which is not only more and more popular with the manufacturing of PCBs but frequently used in the SMT assembly process, MCM assembly process, TBGA process and so on. 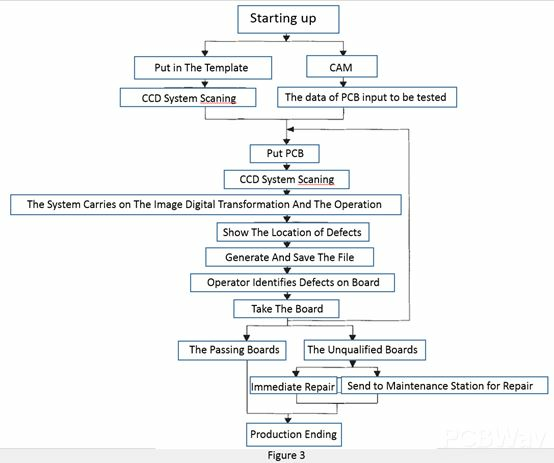 The function of AOI system is to detect the defects in the manufacturing process of PCB or prevent defects from occurring, carry out process control, and eliminate or reduce defects through correcting the process. AOI system is usually placed in the key position of the production line, which monitors the specific production status and provides necessary basis for the adjustment of production process, such as quality inspection of SMT, printing quality inspection, welding quality inspection, packaging quality inspection of multilayer ceramic substrate and so on. In the process of PCB manufacturing, the items that need to be tested are the defect of welding pad (such as short defect, gap and diameter reduction, pin, sag, protrusion, etc.) and line defect (such as short, open, line width/spacing, gap, protrusion, sag, copper slag, pin, size or position error, hole blockage, etc.). 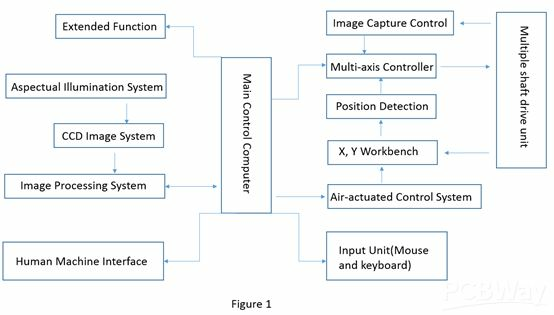 The core structure of automatic optical inspection system is a CCD image system, ac servo control x, y workbench and image processing system. See figure 2. In the test, the first step is to put the PCB on AOI system workbench, after positioning, choosing the need testing program, and then, X, Y worktable moves the PCB to the lens below. At this time, the lens capture the image of the PCB and the processor starts the image analysis processing before it moves to the next position. Thus, the higher detection rate is obtained through continuous processing of image. 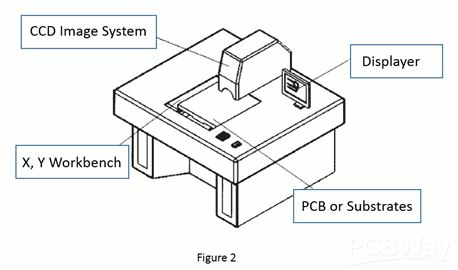 AOI system automatically scans the PCB to detect and get the images that may have some defects on PCB and make them into digital processing through the optical section. And then comparing these images with pre-existing "template" images, marking the defect and giving the location hints through the analysis, processing, and judgment, generating the file at the same time, waiting for the operator to further confirm or sent to maintenance station for repair. See figure 3.